NAD+-dependent DNA ligases are present in bacteria, some entomopox viruses and mimi virus. Since NAD+-dependent DNA ligases are essential for bacterial growth, they are valuable targets for identifying novel antibacterial agents. 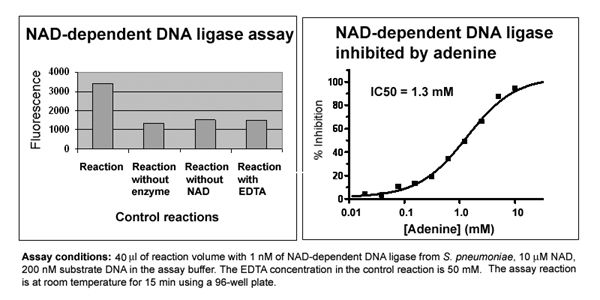 The NAD+-dependent DNA Ligase Assay Kit is to measure the DNA ligase product in which the diphosphodiester bond is formed at the single stand break of a duplex DNA substrate. The ligase reaction is monitored by the fluorescence intensity at 535 nm. The assay is in 96-well plate format and can be used for screening inhibitors of DNA bacterial ligases. Each kit includes the assay buffer, DNA substrate, Reagent T and the fluorescence dye for 100 assays. Reagent T is used to stop the reaction and denature the DNA at the end of the ligase reaction. Ligase is not included in the kit. Each kit includes the assay buffer, DNA substrate, Reagent T, E. coli NAD+-dependent DNA ligase and the fluorescence dye for 100 assays. Reagent T is used to stop the reaction and denature the DNA at the end of the ligase reaction.